Why people come to me on this, I don't know. It's not exactly a frequent topic here, and definitely not a "how to" site. Actually, they should be asking Nicky, he's even more of an expert than I am! Buon giorno. In our last exciting episode, I was going on about how excited I was to have a Kindle Touch, Wi-Fi, 6" E Ink Display e-book reader. I must repeat, however, that I have no experience with any of the other readers on the market. They're probably just fine. Another thing I should repeat is that I am getting nothing, in any way, for endorsing products and services. This is just another public service from Stormbringer Productions, capice? Speaking of public service, I wanted to make my Weblogs available for Kindle. It turns out that I cannot just give them away on there, people will have to pay to subscribe to them (just like with other Weblogs sent to Amazon). Not much, but my content is to remain free. So no, you have to read them in the usual ways. Amazon is somewhat proprietary in that they sell books primarily in their own AMZ format rather than the much more popular ePub format. It also reads PDF to some extent, and also Mobi. They may add ePub functionality in the future. All of these formats have computer reader software available (most likely, you already have Adobe Acrobat Reader for those PDF files floating around all over the place), and it is free. There are also apps available for "smart phones" and things to read these files. Electronic products (as well as software) change rapidly. At this writing, however, Kindle is the most friendly to Wi-Fi document delivery. Here is where I found things to get exciting. The two fun bits I'm about to discuss are not difficult to do. They make more sense and are a bit easier if you pay attention, are familiar with your Kindle account, and are willing to follow directions (unlike some people I can name). One fundamental instruction common to both involves adding the names to the "Approved" list your Kindle's "Personal Document" settings. I am writing this as a Firefox user, though you can go to the sites (linked below) to get instructions for other browsers. The first item that I found was "Kindle It". This simple add-on gives you the options of firing off a Web page straight to your Kindle, or directly saving the Web page as ePub or Mobi. 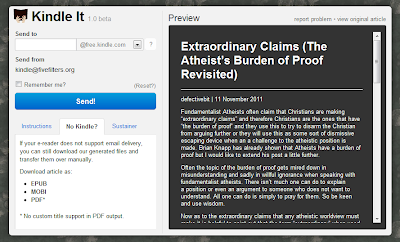 You can share these documents with other people, Kindle users or not, since they can download readers for their computers and things. The junk is stripped out, so you only have the real article. Just for giggles, I made my previous Kindle article available for e-book download, Mobi (for Kindle) is here and ePub is here. I'm thinking of adding a download section to Piltdown Superman so people can grab the articles I've linked, since they have URLs and full attribution. One of the main reasons I got the Kindle was to reduce eye strain, since I spend a great deal of time in front of monitors every day. 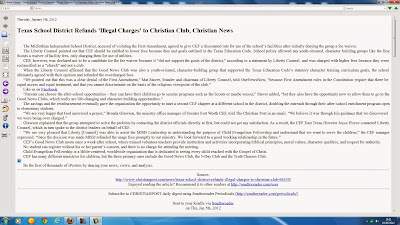 Sending a Web page or an article to the Kindle is a great thing! Sure, some of the formatting suffers, but I don't care. 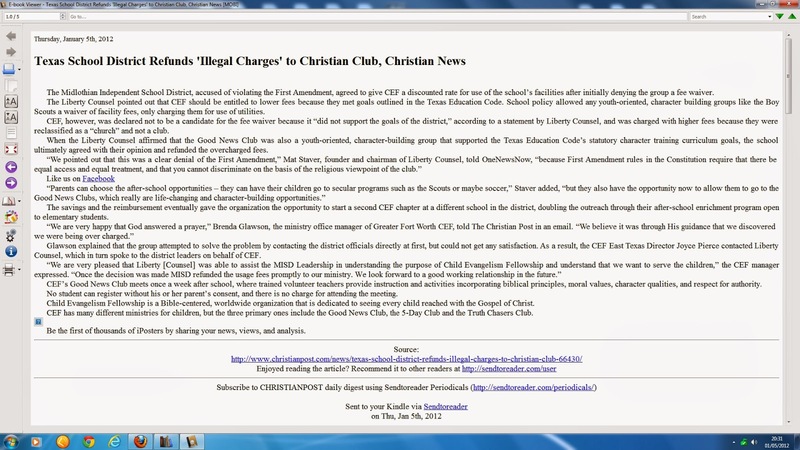 By the way, the Web page articles are not space hogs. For that matter, books themselves are not likely to clutter your storage. I have a Bible that is 12 megs, but Ben-Hur is less than half a meg. Another Bible is about a half a meg, too. Like I said, Calibre will manage your e-books, and convert between formats (as long as they're not "protected"). You can also subscribe to various periodicals, find e-books, share your (unprotected) content, e-mail your books and things to your Kindle, arrange your library in many ways, transfer your content directly to your e-book reader when it's connected to your computer, get DRM-free e-books — all sorts of fun things. I have scratched the surface on Calibre's capabilities, but I'm pleased with what I've learned. Speaking of learning, there are forums for that, and plug-ins for the technologically inclined. Although I bought the Kindle for reduced eye strain, portability, accessibility and the like, these other items make it into an invaluable tool. And I feel like I have some control over it. If you're having half as much fun as I am, then I'm having twice as much fun as you! Yeah, so I stole that joke, it's still funny, innit? 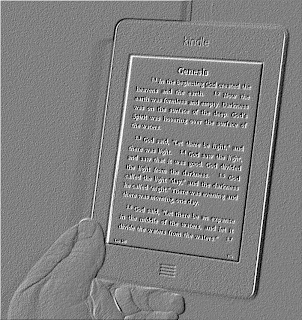 The title of this post is a play on words, because I am excited about my new Kindle Touch, Wi-Fi, 6" E Ink Display reading device. It arrived on Friday, 30 December 2011 anno domini. 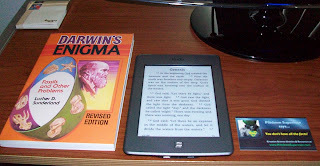 Which is really great, I wanted to usher in the New Year with a new gadget and new reading material. By the way, nobody is paying me for this write-up, I'm getting nothing for it. Also, these are my experiences with this particular device. There are others out there and I am sure they are adequate for their tasks. I will not put any of them down because I have had no experience with the others. "Big deal, Uncle Bob! I don't have any kind of e-book reader." Amazon will set you up with free Kindle software for your PC. There are other readers for your PC (including an ePub Firefox add-on), as well as apps for smartphones and other gadgets. So, if you want to try the e-book experience before you buy an e-book reader, you're set. If you don't mind reading at a computer monitor, which is one of the reasons I got the Kindle. Click for larger image. I held it oddly for the picture, but one-handed reading is easily done. 5-1/4 x 8-1/4 paperback, Kindle Touch, business card. Click for larger. This bad boy is lighter than most common paperback books. The psychic paper "E Ink" display looks startlingly like real paper. It is not backlit, so you need to have external lighting. (Laura Ingalls Wilder read her Kindle by candlelight, and Hoss Cartwright used a kerosene lamp.) If you want something that is backlit, with color and the ability to watch videos and such, they have the Kindle Fire, Full Color 7" Multi-touch Display, Wi-Fi . I didn't want all that. May as well go all the way and get another full computer, capice? New books cost slightly less than real books, but the prices come down. There are literally thousands of free e-books available. Most of these are classics, but there are occasional free e-book offers. Also, prices come down over time (like when you want to buy the latest DVD or CD, just wait a while and it will usually become drastically less expensive). 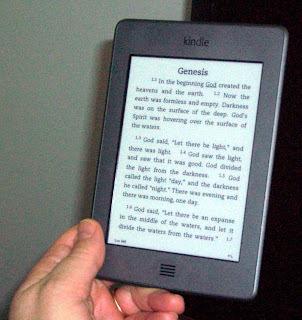 Amazon itself has many of the free and low-cost e-books on their site. It feels kind of funny to select the "1-Click" purchase for a free book. Although I love books (especially Bibles), turning pages, the smell of a quality new book, the pleasure of just reading, I need the portability and convenience. Instant delivery and no shipping charges are another big plus. Instant delivery, so an e-book can be a great emergency gift idea for a Kindle user. And I understand that a library of about three thousand books can be stored on a Kindle. Groovy! Speaking of library... I understand that some libraries are hooked up so that you can actually borrow e-books. For that matter, I read that you can hook up with other users at Amazon's site and borrow their books, but I don't know anything about that yet. There are hundreds of e-book sites besides Amazon and Barnes and Noble. Google itself claims to have millions of the things! You can also subscribe to magazines and periodicals, both paid and free, but I haven't explored those possibilities yet. More about why I'm not chasing that down yet in the next installment. The Barnes and Noble "Nook" e-readers are similar (some have even said that they essentially copied the Amazon models, but others said that Nook has some features that they would like to see on Kindle, so who knows). 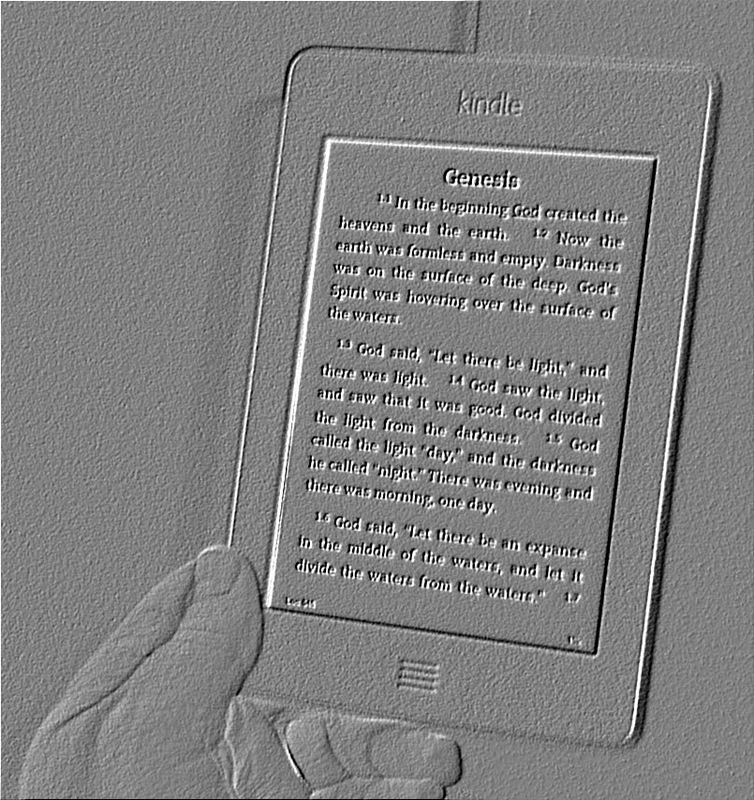 Nook primarily uses the ePub format, which is the most common. Amazon does not accept the ePub format, but that may change. Converters are available to change ePub into a format that Kindle accepts, especially the free non-DRM books. Some converters can be made to strip away the DRM so you can use your purchased book on another device, but I am not going into that now. Besides, I haven't tried to do it yet. 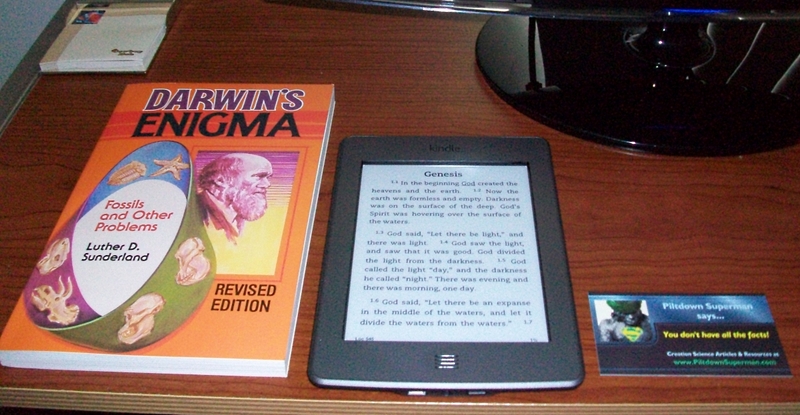 In the pictures above, you can see my new Bible on the Kindle. It is the WEB version (World English Bible), a new, respected, accurate, readable translation. It is free all over the Web (including audio), but I paid $5 USD because this version had special formatting for the Kindle; I can type in a reference and bada bing! I'm there. My point is that some things that are found free can be obtained for a price because someone put extra work into formatting and so forth. There are four drawbacks to my Kindle touch. I mentioned needing a light source, and there are clip-on lamps available if you want to read in a dark room and not disturb someone else. There is no free-standing charger. Although the battery life is supposed to be a phenomenal two months, you trickle-charge it through your computer's USB cable. External chargers are sold separately. My model has advertising ("special offers"). Before it arrived, I was resigned to seeing and ignoring a crawling message across the bottom of the screen. Such is not the case. The advertising kicks in when you're on your home page or it is in sleep mode, so you are not bothered in the least when you're actually reading something. Fourth, there is no case. That's an important one for me. So, I shelled out a few more grotzits after reading reviews and examining the products specifically for this model at Amazon's site. I'll let you know how it is. A fifth drawback is that sometimes when you tap the screen for a menu option, nothing happens. But I suspect part of that is because the book in use is so large, I have to tappity-tap until it pays attention. Or it may be just a bit of finesse that I need to learn. That's enough excitement for one day. Next time, I'll tell you about the e-book stuff that put my excitement into overdrive. Here it is. Ciao!